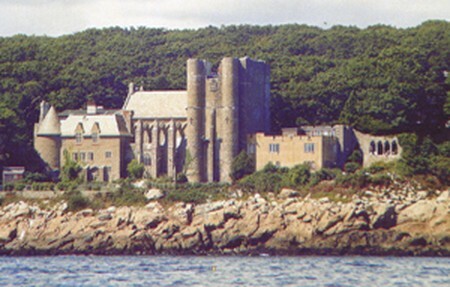 John Hays Hammond, Jr. built his medieval-style castle between the years 1926 and 1929 to serve both as his home and as a backdrop for his collection of Roman, medieval, and Renaissance artifacts. The castle was constructed as a wedding present for his wife Irene Fenton Hammond to prove how much he cared for her. In addition, the building housed the Hammond Research Corporation, from which Dr. Hammond produced over 400 patents and the ideas for over 800 inventions. Second only to Thomas Alva Edison in number of patents, John Hammond was one of America's premier inventors. His most important work was the development of remote control via radio waves, which earned him the title, "The Father of Remote Control." Visitors to Hammond Castle Museum are welcome to explore the castle on a self-guided tour of many rooms (map supplied) including the great hall, indoor courtyard, Renaissance dining room, two guest bedrooms, the inventions exhibit room, the library, the War room, the kitchens, the Natalie Hays Hammond exhibit room, servants quarters, as well as several smaller rooms and passage ways including a secret passageway. We suggest that you start your tour in our AV theater where you can view a short film on the life and times of the Hammonds. Visitors may also enjoy the beauty of the castle grounds and a view of the Atlantic shore line while strolling through our gardens or sitting on a bench taking in that view.. In addition to self-guided tours, Hammond Castle Museum offers a number of educational programs and prearranged tour opportunities for school and tour groups. Our staff is always available to discuss the Hammonds with you as well as our unique collections.